Central Trains services have recorded their best timekeeping for seven years, the company said. Nearly 83% arrived within five minutes of their advertised times in the autumn and early winter last year, a 10% improvement on the same period in 2005. 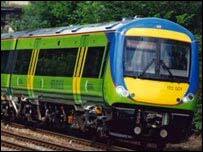 The company said the figures, from the Office of the Rail Regulator, reveal a 16% improvement on 2004. The firm runs more than 1,300 services a day in the Midlands with about 115,000 journeys made by passengers. Managing director Steve Banaghan said: "A lot of work, by both our staff and our industry partner, Network Rail, has contributed to this improvement. "Even so, we will continue to aim higher."